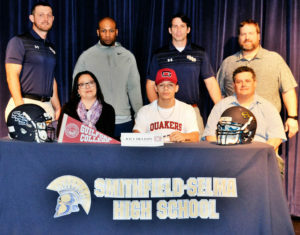 Smithfield Selma High School football standout Joey DeLeon has signed to continue his career with Guilford College. Joey was recruited as a wide receiver. He is expected to play slot receiver for the Quakers of Guilford next season. Pictured Front Row: Peggy Deleon, Joey Deleon, Joe Deleon. Back Row: Head Coach Mike Parrish, Defensive Coordinator Mike Harper, Offensive Coordinator Scott Parrish, Offensive Line Coach Craig “Majestic” Faircloth.